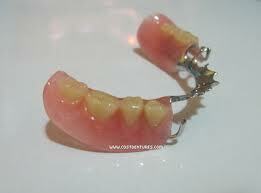 A partial denture is a removable prosthesis; it is usually consist of replacement teeth attached to pink or gum-colored plastic bases, which are connected by metal framework. However partial dentures are not suited as a permanent solution due to the fact that, using fixation clasps, teeth will be damaged and loosen. Furthermore, the toothless part of the jaw is subject to a loss of the jaw bone, thus it is essential for most patients to regularly reline the partial denture in order to improve the position of the denture on its base. Partial denture offers numerous advantages. The frameworks are cast to fit the teeth. Since they sit on the teeth, as well as being attached to them, they are extremely stable and retentive. The teeth have been altered slightly beforehand in order that the partial denture can rest upon them without interfering with the way the patient bites the teeth together. It also has many other advantages like it may preserve the natural tooth placement of your existing teeth. They ensure proper chewing and digestion by thoroughly grinding your food. A properly designed partial denture will assist in support of your existing teeth. A removable partial denture will add enjoyment to your life. A full set of upper or lower teeth, mounted in a plastic base. 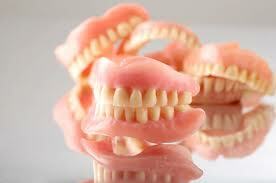 Dentures are also called false teeth. The fixation of full denture is mainly achieved by the suction effect between the dentures and mucosa. Thus the exact fit of the denture is absolutely essential. Thangam’s Dental Clinic Mylapore offers one stop solution for all your dental care needs. With services ranging from routine examinations to lasers, Thangam’s Dental experts help you through your Dental problems & help you gain more confidence & add sparkle to your Smile. It is a modern state of art specialty Dental clinic situated in the heart of Chennai (Mylapore) that provides up to date, quality care for patients from across the Globe using high-tech equipments.